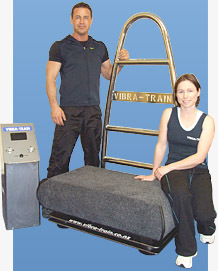 There are currently 5 models in the Vibra-Train series of machines, with more in development. 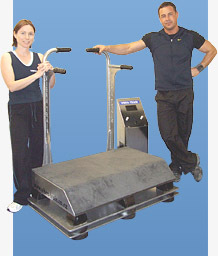 Each machine is designed for a specific task. They are of the highest quality and have a structural lifespan of approx 20 years. The bearings may need changing every 5-6 years, depending on the model. This can be performed quickly and inexpensively. All our units are designed to take over 300kg and will still look good after 10yrs of solid work. Cosmetic but functional covering like the carpet, comes with a 2 year warranty and is also inexpensive to replace. These devices have been built for commercial use and that's exactly what they will do; sit on the floor and do their job for a very long time. And for that reason the electronics are separated from the vibrations. No flashy lights, just a large timer to indicate countdown. So no glasses needed. They also have safety features such as an 8 second start delay for posture correction and limited Hz settings as to not allow ISO regulations to be exceeded; but full range from 40-50hz can be achieved. Each machine has large Stop button . Please note, we do not sell machines to the public and can only be accessed at a licensed Vibra-Train studio. Timer: 1min, 2 min, 3 min. They come in thermo-coated pressed steel (8mm-16mm) Grey anti-heat, rubber backed ,vibration carpet (for sterile wash-and-vac cleaning). Simply put, these machines can take a beating and still look great. The "BULLET" is our newest and to my surprise, the most popular machine we have made yet. I first designed this unit as just a replacement for any of the lighter European models that couldn't handle the pace. I just went a little overboard. It is a workhorse and is also our most stylish model to date. The Bullets come in full chromed steel with all the extra improvements of our other models. We never sell these to the public and are only available to our licensees to run from licensed Vibra-Train studios. Every single machine we have ever built is still working in commercial situations, being hammered day after day. No other company globally can make this claim even though they will try to. My advice is to not just believe anyone, including us, and do some research. You will find we are the ONLY company that has not failed in this task.